What bowl will the UCLA football team play in? In today’s edition of Los Angeles News Group papers, I took a closer look at UCLA’s bowl possibilities. This entry was posted in Football and tagged Alamo Bowl, Foster Farms Bowl, Holiday Bowl, UCLA football by Jack Wang. Bookmark the permalink. What is the likelihood that the Alamo Bowl picks ASU over us? Are they known to travel well? Middling to low, I’d say. Both teams ended the reg season on a down note, but a UCLA vs Kansas State/Oklahoma matchup could generate some buzz. I like UCLA vs. Oklahoma. I would love a big opportunity like that too. Even if OU isn’t in playoff picture–they’re good…and they’re Oklahoma. Would be a marquee matchup and signature win if we pull it off. More worried about UofA stealing our Alamo Bowl invite. I think none of those bowls are worthy of our team. We should be lobbying hard for the Fiesta. We should have been playing tonight. We shouldn’t have been blown out by a 6-5 team at home with a conference championship game, playoff spot, and national championship on the line. We don’t deserve the Fiesta Bowl. We gotta earn it and we didn’t. Anyone else notice that UCLA ended the regular season with the highest attendance in the PAC 12? If you want an indicator of momentum (and $) there is none better. We not only pounded SC again, we drew more fans. For those that think the game in Dallas was a boost, it actually was lower than our average attendance. 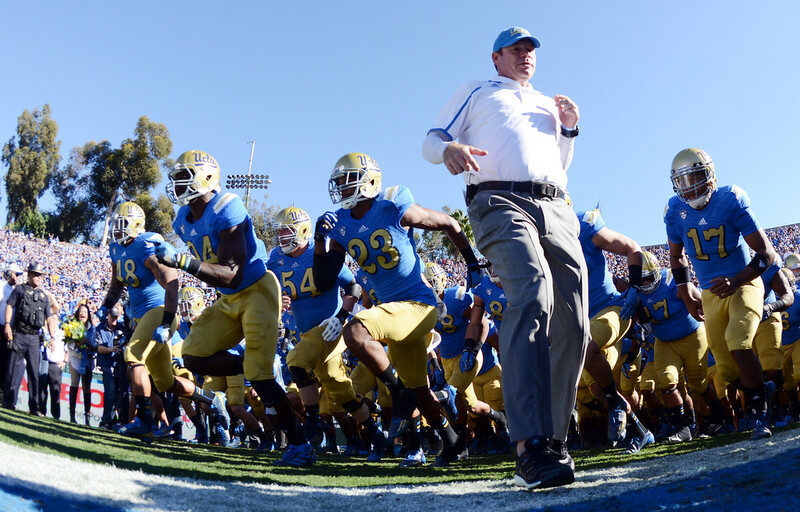 The future looks bright for UCLA football and sports. If Arizona steals our Alamo Bowl invite, we will fall all the way down to the Las Vegas Bowl because Holiday will take USC, Chicken will take Stanford, and Sun will take ASU. And just a week ago, we were a playoff contender with national championship aspirations. And now we’re staring the Vegas Bowl straight in the face. The only thing worse would be losing the Vegas Bowl. If that were to happen, three years of hard work by Mora & Company would be wiped out in one night. Let’s hope Arizona beats Oregon and we end up in the Alamo Bowl. Since Arizona got blown out, what are the chances of UCLA ending up in the Fiesta?